Last weekend, almost as soon as US immigration officials began enforcing Trump’s executive order limiting travel and immigration by citizens of seven Muslim-majority countries, lawyers began to appear at various airports around the country, eager to help those detained at the border. They arrived in numbers so great, The Atlantic referred to them as an “army,” and reported that for hours they far outnumbered the people they were trying to help. Photos of what were described as lawyers busy at work in the airports soon appeared on social media and on newspaper websites. And the lawyers aren’t finished yet. The effects of the travel ban extend well past the several hundred persons detained at US airports to also include many thousands more who are citizens of one of those seven countries and who seek to enter the United States either as temporary visitors, long-term residents, green card holders or refugees. Having learned about the travel ban, they’re not sure if they should even turn up at an airport to try to board their flights to the US. They don’t know if or when they will be able to travel to (let alone live in) the United States again. 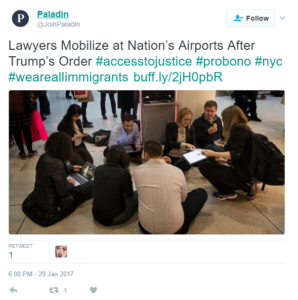 For these many more persons, no longer concentrated in international airports in the US but spread out across the world, the lawyers are organizing themselves on a larger scale. They are gearing up for a long-term fight, on the one hand to oppose the executive order in court, and on the other to reach out to and help as many of those affected by the travel ban as possible. And this organization is taking place not only on a national scale, but on an international one, to coordinate and share information with lawyers and other volunteers around the world. All of this work is being done for free. No one is expecting to be paid. No one is even asking whether any of the beneficiaries of the work might be in a position to pay, even some small amount. Even companies that provide legal services to lawyers are getting in on the game, offering access to research tools and practice management platforms for free. 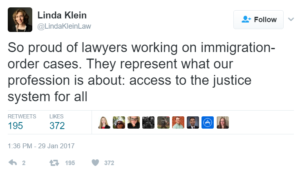 Of course the lawyers’ efforts can and must be lauded, and of course Klein and others are absolutely right to laud them. It’s not just those affected by the travel ban that need legal services — there are many many others that need legal services — and who in many cases desperately need legal services — for many other reasons. But when it comes to those people, we have to ask: where are the lawyers? Each year the National Network to End Domestic Violence conducts a one-day “census” of the number of individuals who sought services in a single 24-hour period, as well as the types of services requested, the number of service requests that went unmet due to a lack of resources, and the issues and barriers that domestic violence programs face in attempting to help victims of domestic violence. Legal services are desperately needed. Legal cases involving domestic violence are often difficult and complex and can include filing for an order of protection, requesting child support, or testifying against the abuser in criminal proceedings. Survivors who don’t have legal representation are frequently further victimized by unfavorable outcomes….Out of all the different types of unmet requests faced by local domestic violence programs nationally, legal representation through an attorney was the second most sought-after service, after housing/shelter. Without proper legal representation or advocacy, survivors and their families continue to struggle with safety issues. In spite of the great need as well as critical importance of this kind of service for victims of domestic violence, on the day of the survey, only 11% of the 1,752 programs surveyed were able to assist a victim with legal representation by an attorney, and throughout the year only 29% had been able to do so. We worked with a survivor who didn’t have the income for legal representation and our community didn’t have legal resources to help her. Because she had to represent herself, she was unsuccessful in responding to the abuser’s attorney’s legal tactics. The result was an order that required her to see her abuser weekly when exchanging the children for visitation. This is causing her great anxiety and fear. Every day we tell survivors that we can’t help them with their legal matters. We don’t have any lawyer who can take pro bono cases, and Legal Aid only has the capacity to handle emergency matters. 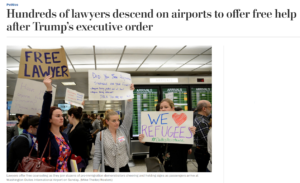 It’s an incredible, even shocking, contrast: This past week there have been “armies” of lawyers ready and waiting at our country’s airports to help those affected by the travel ban — in some cases more lawyers than were actually needed. At the same time, however, there were very few lawyers at our country’s shelters ready and waiting to help victims of domestic violence. The travel ban is new and has very few precedents. Perhaps even more importantly, the ban is likely perceived by many of not most of the volunteer lawyers as part of a larger, urgent and highly compelling issue that affects the country generally as well as them personally, which is the direction of Trump’s presidency. Mobilizing in this manner to help those affected by the travel ban is a way to express opposition to Trump and the policies of his Administration. It is more concrete than simply joining a demonstration, and for many of the lawyers likely more gratifying and offers more immediate results. In contrast, domestic violence is hardly new, it has countless precedents and its effects are confined for the most part to the victim and his/her family (at least, its effects are generally perceived in that way). Certainly instances of domestic violence do not raise such fundamental questions about our values as a nation and how our country should be governed. In this manner, providing legal assistance to victims of domestic violence understandably seems far less compelling and far less urgent as compared to providing legal assistance to those affected by the travel ban. I can’t help but think — how might it feel to be one of the 4,7 million women who are victims of domestic violence each year in the US, be in desperate need of legal assistance but unable to pay for it, and so have to go without, with potentially dire consequences, notably suffering more violence? All the while knowing that “armies” of lawyers were, at that very moment, on standby at airports to help some of the several thousand people estimated to be affected by the ban? Their problems as a result of the ban are without a doubt considerable, but in most cases unlikely to go so far as physical battering. And to add insult to injury, those affected by the travel ban who are in a position to pay for legal services are nevertheless getting them for free, while so many victims of domestic violence are denied legal services for the simple reason that they are unable to pay for them. The army of lawyers who are on duty at our country’s airports and beyond have shown a remarkable and truly impressive ability to organize and mobilize on very short notice and with effective results. They are obviously motivated to help those in need. When (if?) the dust settles on the travel ban and the lawyers leave the airports for a well-deserved rest, I hope that they will reflect on what more they can do to help others who are in equally if not more desperate need of legal services. I’m not talking about these lawyers doing more pro bono work themselves — their resources are limited and it would be unreasonable to ask them to do more in that way. But it would not be unreasonable to ask them to take a good, hard look at the lawyer monopoly on legal services. To take a good, hard look at how the monopoly, together with Model Rule 5.4, operate to deprive a great many people of badly needed legal services. For example, Australia’s Salvos Legal Humanitarian provides free legal assistance to victims of domestic violence as well as to others who need legal services but have limited means. Salvos Legal Humanitarian and its sister company, Salvos Legal, are both wholly owned by The Salvation Army. Salvos Legal provides commercial and property legal services on a paid basis and the fees it collects, less expenses, are used to fund Salvos Legal Humanitarian. The two companies operate with 16 offices in eastern Australia and since its founding in 2010 to date, Salvos Legal Humanitarian has provided free legal assistance for nearly 18,000 matters. Salvos Legal Humanitarian has done this without any government funding, and without any funding from The Salvation Army. (Contrast that to Catholic Charities which receives significant funding from both the government and Catholic dioceses). Services like Salvos Legal and Salvos Legal Humanitarian are illegal in the United States. This is because of rules that, on the one hand, grant lawyers a monopoly on the provision of legal services, and that, on the other hand, prevent lawyers from sharing fees with nonlawyers (Model Rule 5.4). Again, it is obvious that the airport lawyers are motivated to help those in need. Once the airport lawyers have had their rest, I hope that they will turn their obviously considerable talents and energy towards the abolition of those two rules, in order to open the market to a greater variety of persons and structures who can join the airport lawyers in helping to meet the very large and in many cases equally desperate need for legal services.